It’s been more than half a century since the Sir Ambrose Shea Lift Bridge officially opened, connecting the Newfoundland and Labrador communities of Placentia and Jerseyside. The bridge was designed to span the “Placentia Gut”, a channel of water with tides that change direction every eight and a half hours. The tides themselves can attain speeds of up to nine knots. Using an unusual design for its time, the Sir Ambrose Shea Lift Bridge consists of two approach spans and one centre vertical lift span. Each measures 30 metres in length. The centre vertical span – which can be raised from a clearance of three metres to a height of 21 metres in one and a half minutes – weighs 100 tons. The centre span of the Sir Ambrose Shea Lift Bridge is raised, on average, 2,500 times each year. It comes as no surprise then that the provincial government’s Department of Transportation and Works was forced in 2011 to tender the construction of a new lift bridge that would replace the aging structure. A $40.6 million contract was eventually awarded in March 2013 to HJ O’Connell Construction Limited, a joint venture between a division of Bird Construction Inc. and Vancouver Pile Driving Ltd. The government contract consists of replacing the aging Sir Ambrose Shea Lift Bridge with a new lift bridge in Placentia directly adjacent to the existing one, as well as realigning the adjacent roadway Route 100 and removing the old bridge once the new one is operational. Also included is the building and equipping of a control house for the bridge’s significant mechanical and electrical components. The project is expected to take three years to finish, with an anticipated January 2016 completion date. The new bridge was designed by Parsons (formerly Delcan), an engineering, construction, technical, and management-services firm. 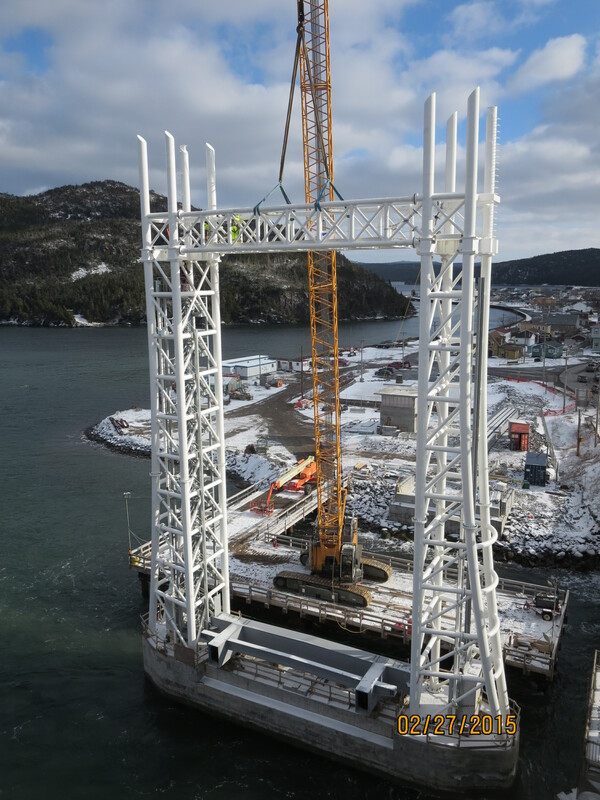 The new lift bridge requires the building of two 58-metre long temporary trestles, with 600 millimeter pipe piles and a deck, to enable the placement of a 150-ton crawler crane. 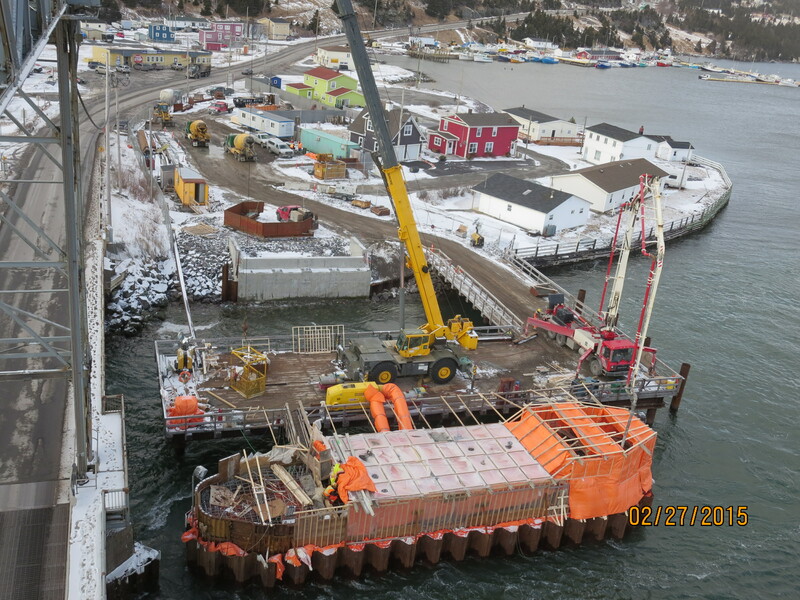 The crane is used to construct the two new central piers deep in Placentia Bay. “Each pier required that we build an L-shaped work trestle and a cofferdam out to each of the two piers,” states Clancy Lannon, Project Manager, Vancouver Pile Driving. According to Lannon, each of the two piers required 136 pipe piles of 325-millimetre diameter. Thirty additional pipe piles of the same size were required for each of the two abutments. In total, the new bridge will use: 9,920 metres of pipe piling; 2,200 metres of sheet pile (for the cofferdams); 4,100 cubic metres of concrete; and 1,000 tons of structural steel. The company used Gander-based Central Diving Ltd. for the underwater work. According to Lannon, the new bridge is located approximately 22 meters from the existing one. Vancouver Pile Driving was onsite for 18 months to complete the waterworks portion of this project. Sir Ambrose Shea Lift Bridge has remained and will continue to remain operational during the construction of its successor, aside from brief lane closures. Its 50-year life span, however, has come and gone. Although the bridge has recently been repaired to enable its use until 2016, the community has already shifted its focus to the new lift bridge nearing completion. 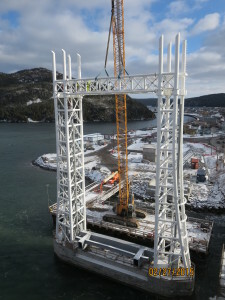 “The new Placentia lift bridge is a lasting and very necessary infrastructure investment which will benefit the people of Placentia and surrounding communities for many years to come,” stated the Honourable Paul Davis, Minister of Transportation and Works when announcing the awarding of the contract to HJ O’Connell Construction. The Honourable Felix Collins, Minister of Intergovernmental and Aboriginal Affairs, and MHA for Placentia, echoed his sentiments. “This is a major development and will ensure the long-term social and economic viability of the Placentia region,” he stated. The federal government has contributed $8 million toward the $40.6 million project.